• For quantitative determination of urease activity and evaluation/screen for urease inhibitors. • UREASE (Amidohydrolase, EC 3.5.1.5) is an enzyme that catalyzes the hydrolysis of urea into carbon dioxide and ammonia. Many gastrointestinal or urinary tract pathogens produce urease. Thus its activity is a useful diagnostic parameter for the presence of pathogens such as Helicobacter pylori. Urease is found in bacteria, yeast, and higher plants. Urease activity is commonly determined in anaerobes of the bovine rumen, human feces and environmental samples such as soils and phytoplanktons. BioAssay Systems? Urease Assay Kit provides a very sensitive and convenient means to measure urease activity in a variety of samples including soil. 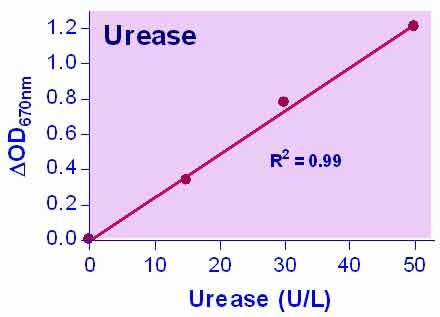 In the assay, urease reacts with urea, resulting in the formation of ammonia, which is determined by the Berthelot method at 670nm. The assay is simple, sensitive, stable and high-throughput adaptable. 1. What could be the reason for very low OD readings? If the standards have low OD values this could be caused by adding the reagents in the wrong order. It is critical to add reagent A first, mix, and then add reagent B. The color reaction is time and temperature dependent. The 30 minute incubation time is for room temperature (25?C). If the temperature is lower, you have to incubate longer to obtain the same OD values. 2. Could we use this kit for stool sample? We have not tested feces samples ourselves and are not aware of any publications using this kit with stool samples, but believe it should work: We would suggest homogenizing the feces sample in a neutral buffer (e.g. PBS) ? urease is water soluble and will dissolve. Depending on the consistence of the sample, I would suggest starting with a 10:1 ratio of buffer to sample and homogenize the sample, e.g. by sonication. Then filter the sample to remove all larger particulates. After that, if necessary, add a centrifugation step (5 min at 15,000 x g) to remove smaller particulates. Only clear supernatant should be used in the assay. 3. How can we extract urease from soil samples? Use 0.5 g soil. Add 0.3 mL of 0.4mm glass beads, 500 µL of buffer. Vortex on high speed for 2 minutes, then centrifuge for 2 min at 12000 rpm, use 100 µL of the clear fluid and incubate with substrate at 37°C for 3 hours.